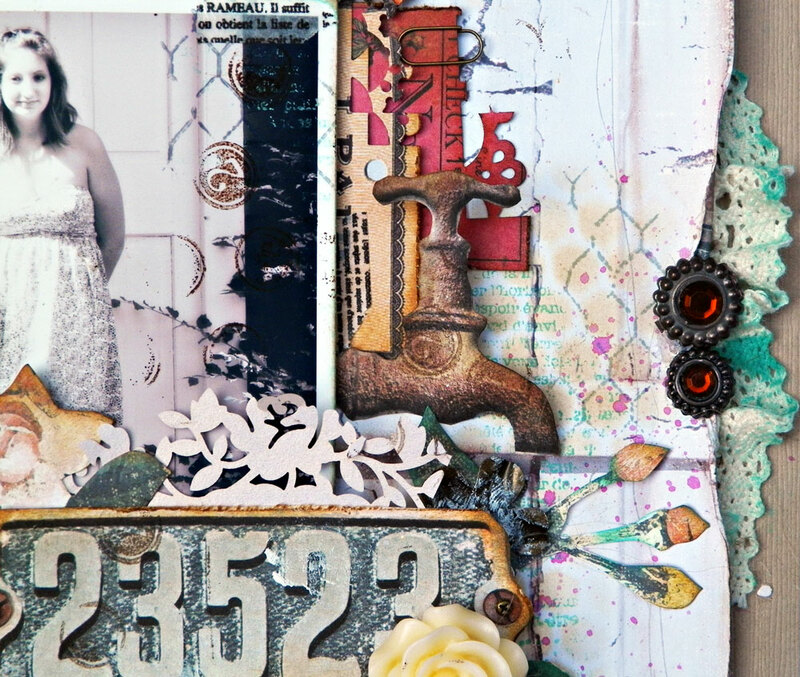 I used the Fabscraps and Teresa Collins papers on this page. 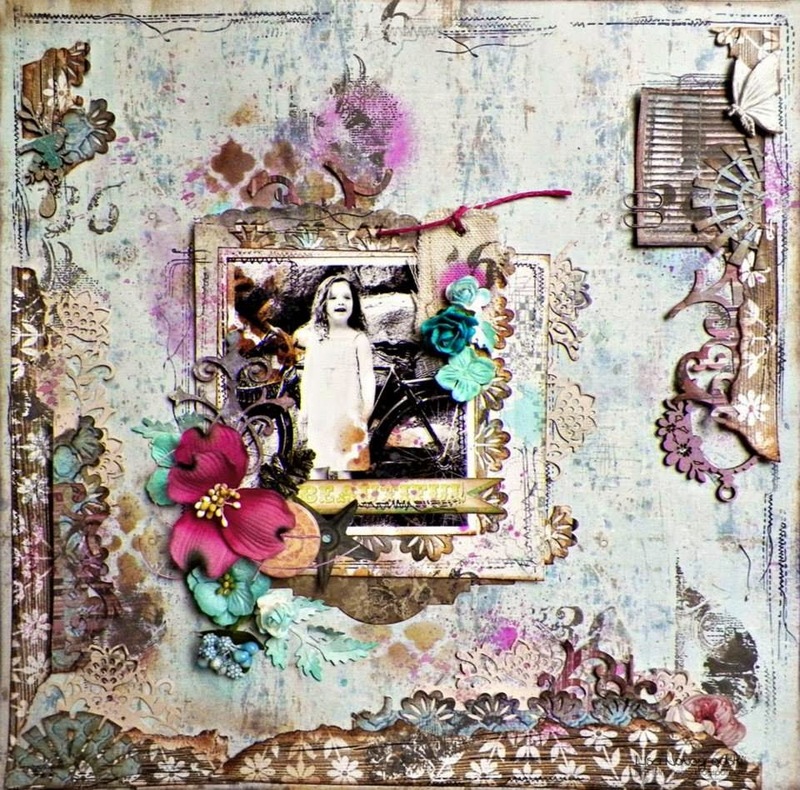 I used the lace paper in the embellishment add on and tore that up tucking in the edges so just the lacy flowers stand out. I've stamped over them... well I stamped over everything! 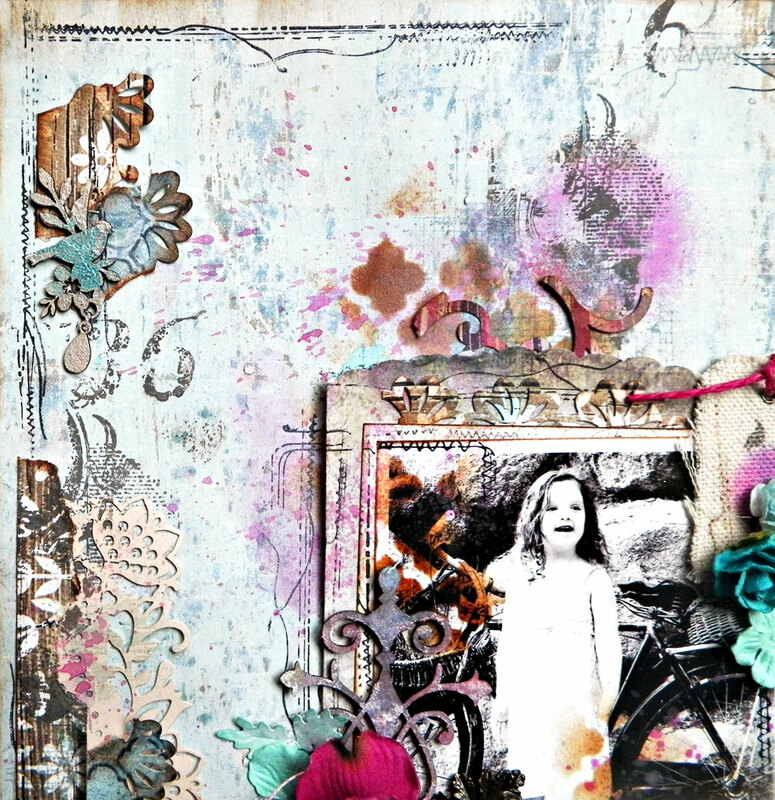 Lot's of stamping, a little masking, misting, drips...oh my! My new thing is to decorate my photo. Why not? Who says the photo has to be matted and untouched right? Mist it, mask it, stamp on it. Play...play...play! I used some Shimmerz textures and Lindys mist on the bird. 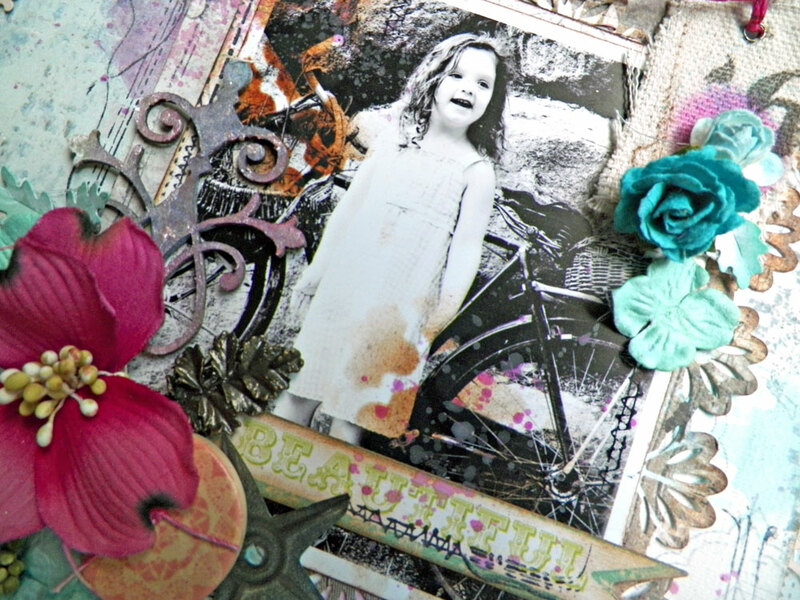 (Included in the color add on) I broke my chipboard up and used the bird on one side of my page and the rest of the beautiful Blue Ferns Studio chippee on the other side. 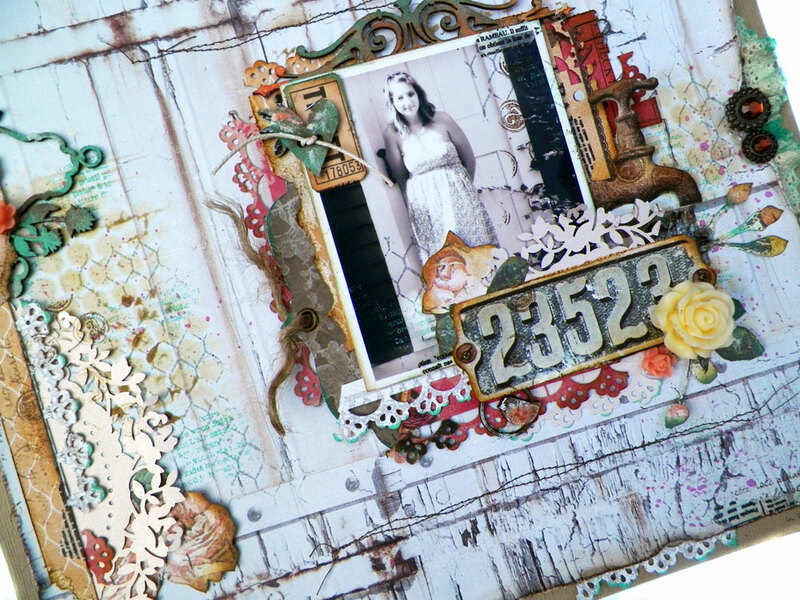 I can't tell you how much I love this layout! And the next is equally gorgeous! 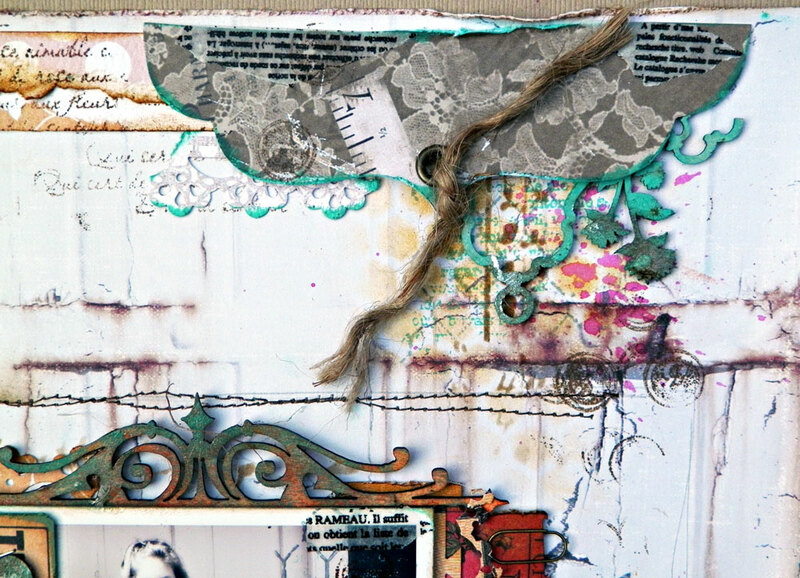 My first page features the Fabscraps Industrial Chic paper for the background with bits of Teresa Collins Life Emporium and Marion Smith Garment District. 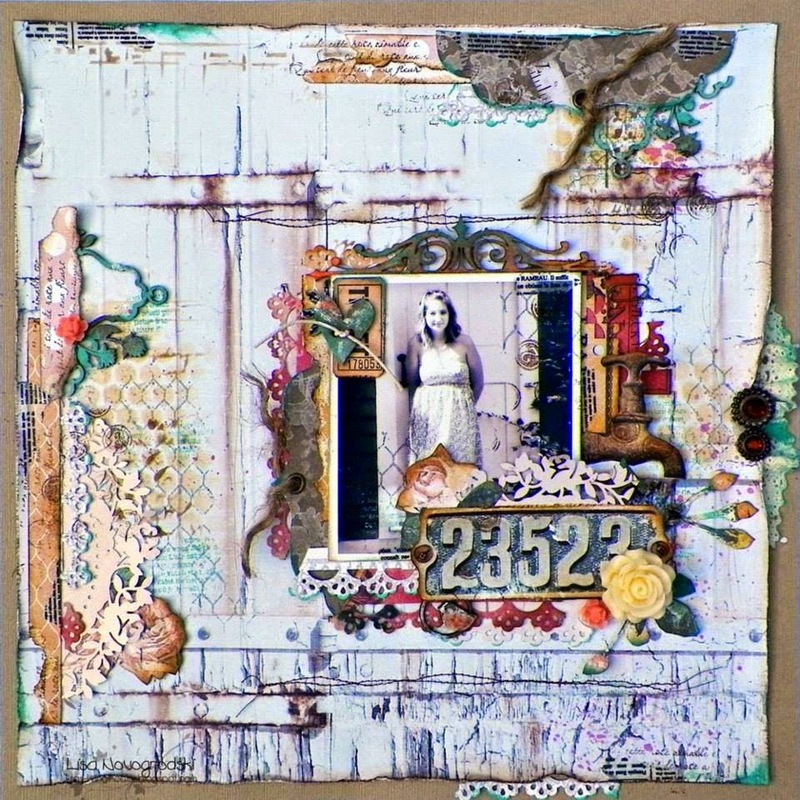 The little envelope flap is a Tim Holtz die that I cut in half and punched a hole an eyelet. I've added some washi tape torn up and sprinkled here and there. I've learned to blend my love of punching with a more mixed media style. I don't punch my whole page anymore but find ways to tuck in punched strips to allow for a pretty touch to soften the more grungy edges. I love collage style. I've explored shabby chic "pretty" and still enjoy that for sure but I really love a little bit more grungy, artsy, still pretty but edgy. Lisa really knocked it out of the park this month! I want to thank you for stopping by, we always appreciate that you took time out of your day to see what we are up to!